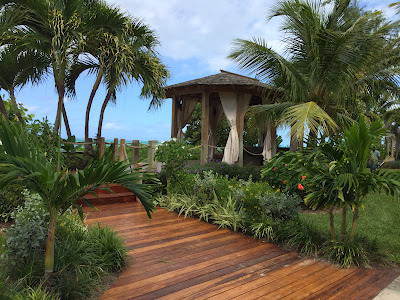 I just returned from a trip where I toured 3 resorts, on 3 different islands, in 3 days. Whew! It was 3 days of non-stop walking, touring, and eating, but my clients are worth it. I'll go around the world for them. 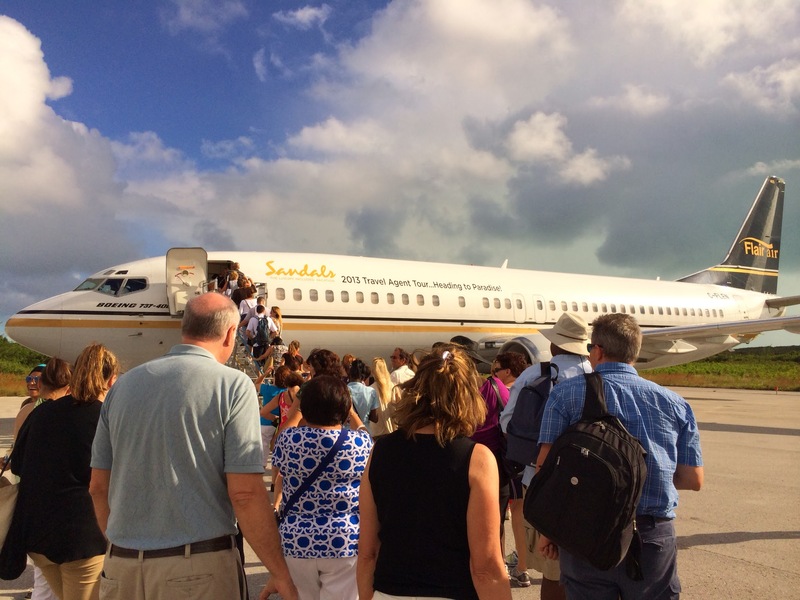 One hundred and twenty-five travel agents were invited by Sandals to tour 3 of their all-inclusive resorts. We boarded a private jet, in Orlando, Florida, on Sunday and didn't stop until we returned Tuesday evening. 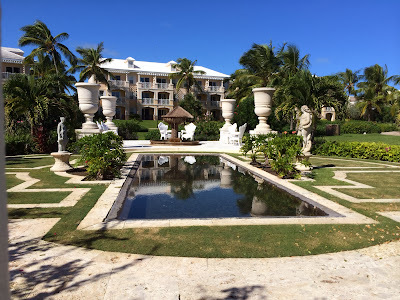 Our first resort was Emerald Bay, in Exuma, Bahamas. Emerald Bay is the ultimate golf and spa getaway. The 18 hole, 7,001 yard, and par-72 course was desinged by Greg Norman. The scenery from the golf course overlooking the blue water was absolutely incredible. Tennis anyone? This property has 6 Har-Tru tennis courts, including a sunken stadium court. Runners? A 2.6 mile jogging trails takes you around the breathtaking greenery and wildlife along the golf course. I didn't bring my running shoes with me this time, but next time, I will. My favorite accommodation was the Prime Minister Honeymoon, One Bedroom, Beachfront, Walkout Butler Villa Suite. This suite allows you to step out from your patio onto the white sand beach. This is the place you want to celebrate a honeymoon or anniversary. Emerald Bay is an all-inclusive, adult-only resort where you can get away from it all, relax and enjoy the beautiful, white sandy beaches. 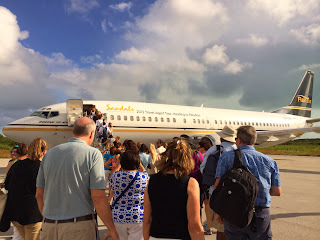 After spending the day in Exuma, we flew to Turks and Caicos. 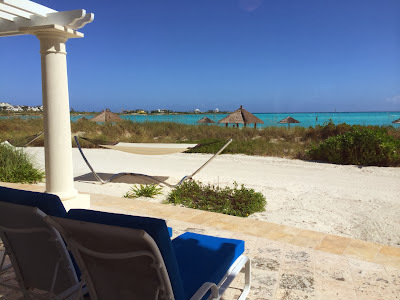 I didn't want to leave the beautiful beaches of Exuma, and I wasn't sure if Beaches Turks and Caicos was going to WOW me. It did. This all-inclusive resort has 19 speciality restaurants with dining options from Caribbean to Japanese, from Italian to French, from Seafood to Sushi. It was impossible to dine at all the restaurants in my short visit, but foodies will love all the different choices here. I frequented Cafe' de Paris, an excellent coffee shop. I didn't even have to pay for my latte or cappiccuno because this is an all-inclusive resort. As a former educator, children's programs on resorts and cruises are very important to me. Beaches Turks and Caicos has an excellent program for kids of all ages. I even saw some dads in the X-Box Play Lounge. They were enjoying the plasma screens and latest games on the market just as much as their children. Want a great view? One of my favorite accommodations was in the Key West Village (Beachfront, 4-room, Butler Villa Residence with Private pool). This is perfect for a couple families who want to be together. These villas are your beachfront choice. 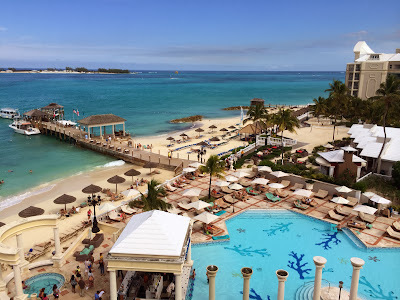 Beaches is an all-inclusive resort for everyone of all ages, which makes this the perfect resort for family reunions, weddings, corporate events, girl friend getaways, etc. Our last leg of the trip was to Royal Bahamian. Once again, I wasn't sure how this all-inclusive resort was going to compare with the last two. How could it get any better? Royal Bahamian is full of charm and elegance. One highlight of this property was the offshore island. Talk about Paradise! We took a 5 minute ferry ride over to the island. On this island was a fresh water pool with a swim up bar, a restaurant, the famous Zen Garden, which offers spa service. What a great feature! Want to be pampered? The one bedroom butler royal suites of the Windsor Beachfront is the room for you. These suites are centerally located and have an incredible view of the ocean. Butler service, 24-hour room service, VIP Rolls Royce or Mercedes airport transfers and exclusive dining at Gordon's on the Pier are part of this ultimate indulgence. 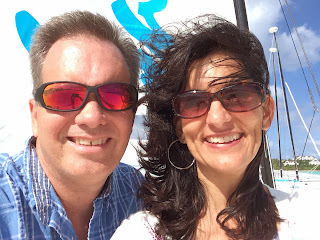 Our tour of 3 resorts, on 3 islands came to a close as we flew from Nassau back to Orlando. Three days of intense property hopping. I'm doing the leg work to be the best resource I can for my clients. Perks of the Sandals and Beaches Resorts: They are all-inclusive resorts. There are no charges for drinks, sodas, snacks, ice cream, speciality coffees or speciality dining. No tipping (except for Butler and Spa Services). No fee to use the water sports. Sandals and Beaches all-inclusive resorts truly are all inclusive. 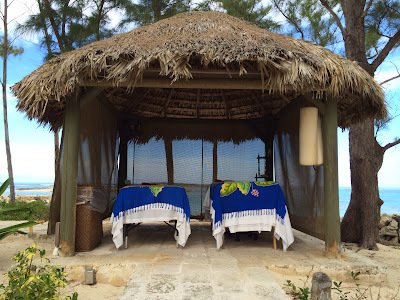 I've personally visited these resorts along with other Sandals and Beaches properties. I am a Sandals Certified Specialist. Get in touch with me today to find out about the perfect resort for your wedding, family reunion, or corporate event.